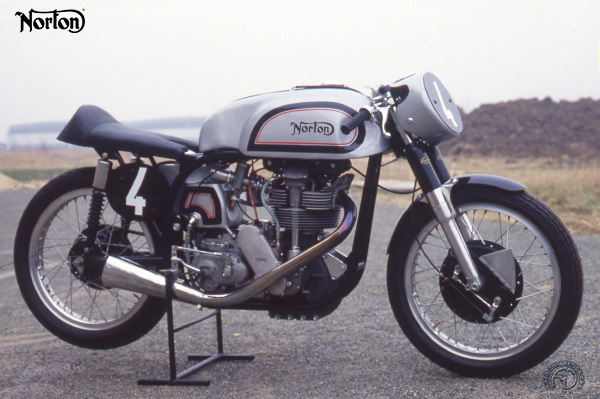 The Manx Norton combined a long career with a long record of success. Norton already had an impressive list of victories to its name when, in 1930, Arthur Carroll redesigned the firm's overhead-cam mode. Between 1931 and 1939, Nortons won race after race: in 1932, road-going versions of the works TT racers were added to the catalog in both 350 and 500cc forms. These were named "International." In 1937, the bronze cylinder head was replaced by an alloy head with twin overhead camshafts. The model's record in the Isle of Man TT was so impressive that to commemorate the company's 1938 victory a new version of the International was launched, called the "Manx." In 1938 the bore and stroke dimensions were altered and the girder front fork gave way to an undamped telescopic fork. Plunger rear suspension was added to create the famous "garden gate' frame. The ultimate development of the Manx Norton came in 1950 when the "Featherbed" frame, originated by the McCandless brothers of Belfast, was introduced on the works racers, setting entirely new standards for handling. Detail improvements continued to be made up to the end of production in 1961, and even after that, the Manx was raced frequently, often defeating the new multicylinder machines. This 'short stroke" 350cc Manx Norton, dating from 1957, was one of the finest models in the Manx's long and distinguished history.